When is the best time to see Gray Whales in Seward Alaska? Gray Whale tours can start as early as the middle of April but most of the gray whales pass thruogh the area in May and June. Be sure to bookmark this site for seasonal updates concerning these tours. Are the Gray whales found inside of Resurrection Bay, or do the tour boats travel further out into the Gulf of Alaska? Tours occur in the gulf as the whales are on their northern migration and seldom if ever enter very far into the bay. Do you provide Gray Whale Tours in Seward AK? No, these tours are offered by local charters like Alaska Whale Watching Tours out of Seward. There are others in the area that offer these tours on a limited basis. Be sure to call for reservations and book any weekend trips well in advance. 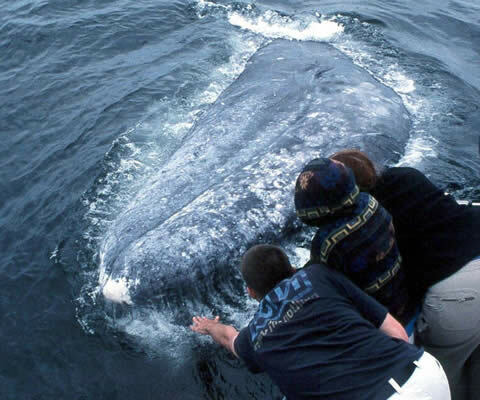 The first gray whales typically show up in Alaskan waters in early April though most gray whale watching tours run from May through June. These whales are on their northern spring migration to the Bering Sea. The whales pass through on their southern migration in mid-October, passing through the coastal Alaskan waters between late October and early January.